NEW YORK (WABC) -- The Yankees closer is Aroldis Chapman. If things go well Friday night he will be pitching around 11:00 p.m. and closing out the ALCS, sending the Yankee to the World Series. Yes, the Yankees have two chances to clinch the series, but they need to get it done tonight. They are riding the momentum after taking three games in the Bronx, and need to keep that momentum going. No one wants to see a 7th game when anything can happen. So the idea is to close it out tonight. Here are the keys to Game 6. The Astros righty dominated the Bombers in Game 2. 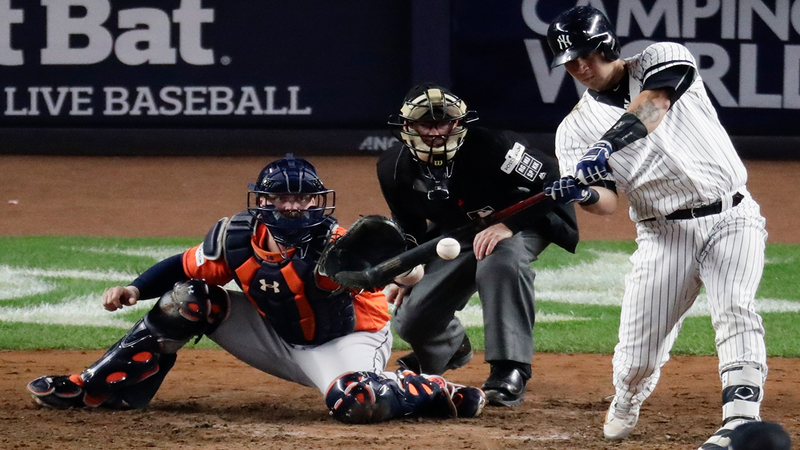 The Yankees need to get to him early to quiet the crowd and put doubt in the Astros' minds. They also need to make him work and throw as many pitches as possible. Getting Verlander's pitch count high gets him out of the game earlier. The Yankees need to keep the score close and let this turn into a battle of the pens. This is not a fair fight and Yankees will dominate if the Astros are forced to use relievers. The Yankees starters have been nothing short of sensational. It's up to Luis Severino to continue that trend. He has the stuff to shut the Astros down, and the ace should be able to do that. Let us not forget the Astros won their only games in their home park. The Yankees need to get past any nerves and quiet the crowd early. If the Yankees win the keys to the game, they will win this game and it will be closing night in the ALCS.